The College has completed the redevelopment of its Earl Street campus to provide new state of the art facilities. The new development provides a Learning Resource Centre with integrated Information Learning Technology suites, as well as teaching areas for catering and beauty therapy students, including high quality training restaurants and beauty salons which are open to the public. 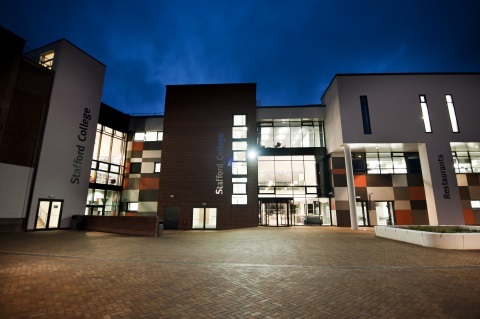 Following the recent merger with Newcastle-under-Lyme College, Stafford College finds itself entering an exciting period of transformation and diversification with a greater focus on STEAM (Science, Technology, Engineering, Art and Mathematics) on the Stafford site. The College has embarked on an exciting £3.5m redevelopment of the Broad Eye Building into a new Science, Technology and Advanced Manufacturing Centre, with a brand new curriculum offer planned for the Centre from September 2017. The new curriculum offer includes nine new ‘Combined Pathways’ which will focus on high academic achievement alongside development of technical and professional expertise relating to a career pathway. Students will study a specific vocational qualification alongside a relevant choice of A-levels providing an individualised study programme to suit their future university or career aspirations.